A rich, argicole rum of a depth and flavour I savoured for literally hours – it almost qualifies as the perfect comfort drink, and for sure it’s the best sub-10 year old rum I’ve tried in ages. 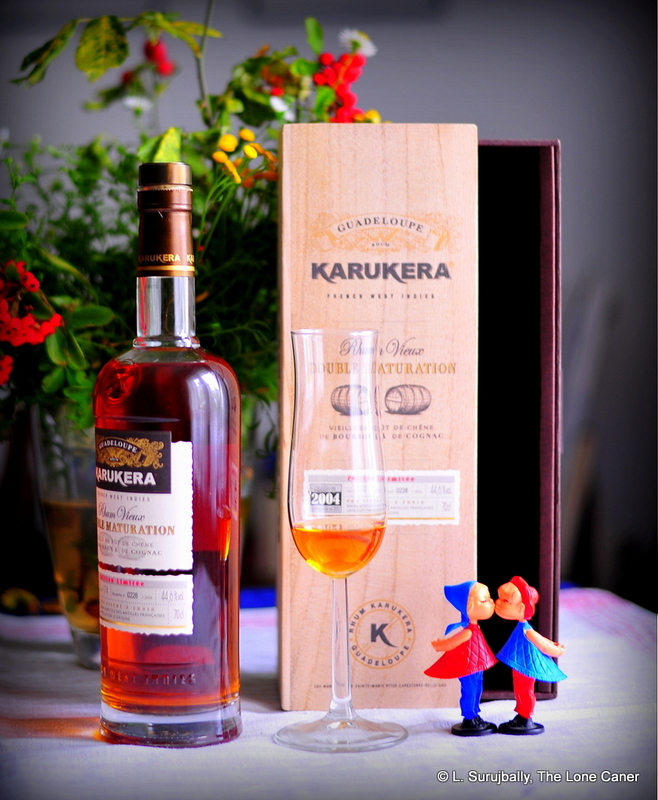 Karukera in Guadeloupe is a distillery for whom I have grown to have a great deal of respect: I was not won over by their Vieux Reserve Speciale, but the 1997 Millesime was something else again, and I often drifted back to it when looking for an agricole baseline, or a control. On the strength of that positive experience, I decided to step up and shell out for this one, partly because of the strength and partly due to the double maturation moniker, which piqued my interest. Which is not to say that its presentation didn’t appeal to me also – I’m shallow that way, sometimes. It may not be a top shelf super-premium rum, true, yet it did its best to raise the bar for any rum that purports to be a cut above the ordinary. Just look at that wooden box printed with all sorts of interesting details, and the sleek bottle with its cork tip. All very nice – it looked damned cool on my shelf. And so, my lizard brain having been catered to and placated, off I went into my tasting routine to see whether the implied quality inside the bottle was as interesting as what the outside promised. Which it was. Aged for six years in bourbon and then two more in french oak cognac casks, only 2000 or so bottles of honey/amber coloured rum came out at the other end, and mine presented a very interesting aspect, in spite of my having wrestled with mostly full proof pachyderms over the last few months (so 44.6% can almost be considered “standard strength” for me, these days). Let’s just agree it was…gentler. Sleek salt butter, cream cheese and some brininess led right off. To say I was not expecting that would be understating the matter: the rum is made from blue cane grown on the plantation itself, and I was looking for a more standard nose of vegetal notes and some citrus. But after letting the spirit rest in my glass for a bit, ah, there they were. Apricots, black grapes, cloves and orange rind sidled shyly forward, to be replaced by hay and freshly mown grass. There were some spicier oaken aromas at the back end, nothing unpleasant – in fact the whole experience was really quite excellent – a firm mix of salt, sweet, sharp, and pungent smells. Tasting it was a rewarding experience. It was a medium bodied rum, quite smooth and warm, opening up with white flowers, and soft tanned leather. As the nose did, some patience rewarded me with mild caramel, smoke, more leather, which in turn morphed easily into mellow tastes of mango, pears, pineapple, cinnamon, cumin, even marzipan and flavoured port-wine cigarillos (used to love those as a young man). And I was also quite impressed with the finish, which lasted quite long, warmly dusting itself off with white guavas, caramel, and half ripe pears. The rum may have caused north of a hundred Euros, but man, it was a pretty awesome drink. My mother and I shared it in her dacha in north Germany on one of the last sunny days of autumn in 2014 as my son ran barefoot on the grass blowing soap bubbles, and it was the perfect accompaniment to a really great afternoon laze-in. 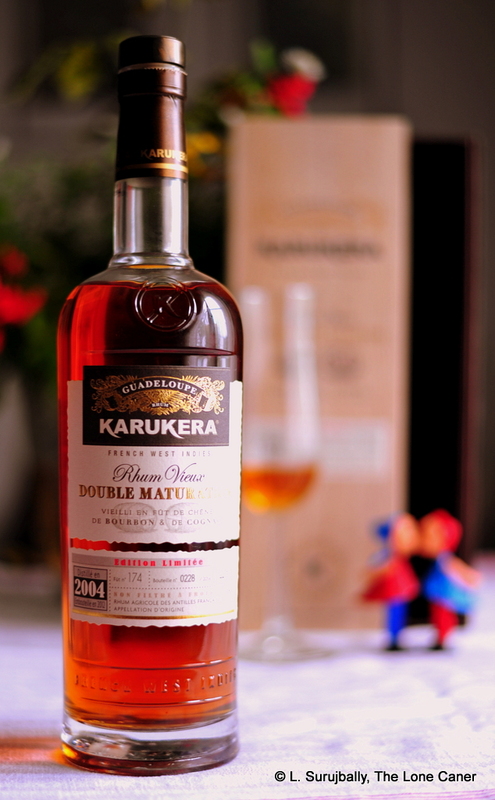 Karukera continues to be made by the Espérance distillery (founded in 1895) a distillery down by the Marquisat de Saint Marie in Guadeloupe, doesn’t chill filter or add anything to its rums, and proudly wears the AOC designation. 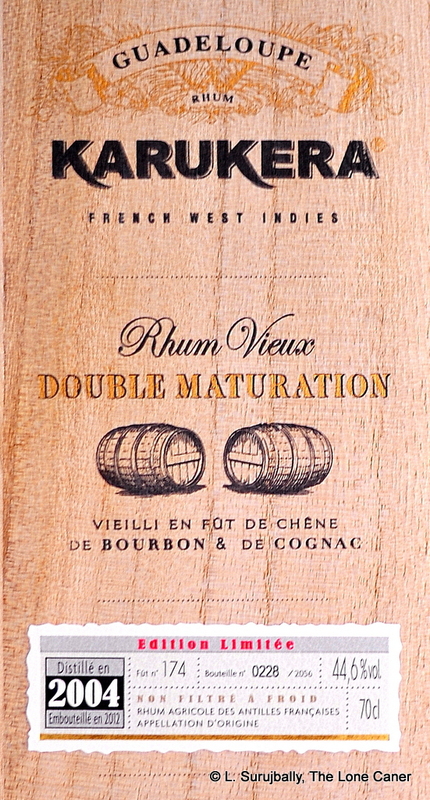 I’ve been fortunate to climb the value chain of its products and each one I try raises the bar for its rums. You can be sure I’ll buy others they make in the years to come. Personally, I’m not sure a rum so warm and friendly, yet also firm and tasty, is suitable for mixing (it was all I could do to see what a few drops of water could do, just to be complete about it) – I know I wouldn’t, on balance. There’s a remarkable softness and overall quality to the Karukera, which, while excelling at no one thing, came together so sweetly that I honestly can’t imagine what a mix could do to enhance it. The rum is excellent as it is, and whether you like molasses spirits or agricoles (or both), there’s no doubting that here is a rum that sneaks past your defenses, hits the sweet spot of your desire for a good rum, and gives you all the love and comfort you could ever ask for. That alone may be worth all the euros I paid.